Bobby Flay says that brunch is his favorite meal of the day because of the many things you can do with it. I totally agree!!! Brunch is so versatile! You can use sweet, savory, fruit, veggies, meat, pastry, you name it and I bet there is a brunch recipe that will include it! So once again, it is Saturday morning and I want to mix it up a little. I love Eggs Benedict. It is an awesome combination of bread, meat, eggs, a creamy sauce and usually some veggies. I have had some spectacular variations of this brunch mainstay, but never have I had it the way I made it this morning. So without further ado I give you my very own Birmingham Benedict!!! This ultimate in Southern Brunch starts off with a bed of two Stone Ground Grit Cakes breaded and lightly fried in bacon grease. 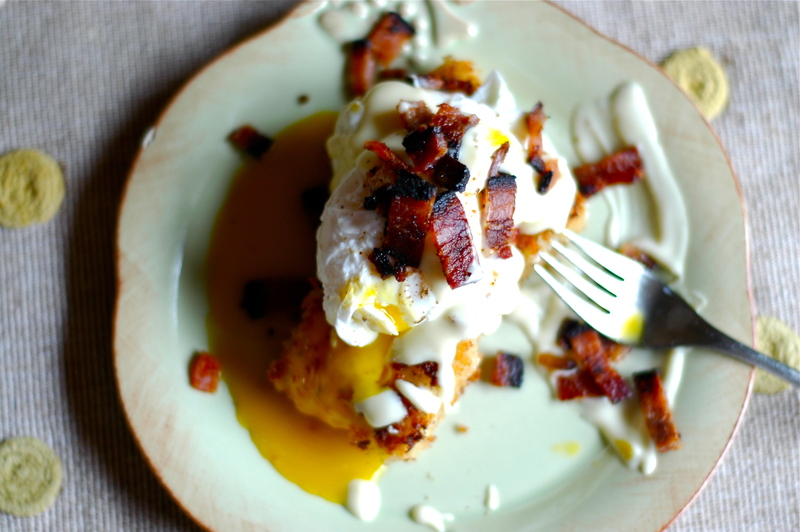 On top of these sumptuous cakes, I add two soft poached eggs, then sprinkle crispy bacon pieces and cover the whole thing with a White Cheddar Cheese Sauce. This meal was exceptional. Seriously. Enjoy. 1.Grits Step 1: Firstly, it is so important to use good quality stone ground grits. Both the quality of the grit as well as the texture they provide are very important to this dish. Follow the instructions exactly to make 2 servings of the grits. When they have finished and have reached a rich creamy consistency I like to spray a 6×6 plastic container (we use our left over container or a sandwich rubbermaid container) with spray oil and then add the grits. The spray will help them come out even easier when it is time. As soon as these are finished place them into the freezer until it is time to cook them in the bacon grease. You can make the grits the night before. If you do this you can put them into the refrigerator instead of the freezer. 2.The White Cheddar Cheese Sauce: in a small sauce pan over medium heat add the butter and let melt. When it has melted and is bubbling add the flour and whisk making a rue. Let this cook over medium heat for a minute while stirring. When fully combined whisk in the cream, milk and nutmeg. Add more milk as needed to achieve the consistency wanted for the sauce. Finally when you have a smooth cream sauce add your shredded white cheddar and whisk until fully combined and silky. Add salt to taste. Sit aside. 3.Grit Cakes Step 2: This recipe makes enough for three people to have have to cakes and 2 poached eggs. it can easily be modified for six by just giving everyone one cake and one egg. Cook the bacon until crisp in a skillet. Take the bacon out and chop into small pieces and leave a side to cool. Leave the grease in the pan and take off the heat and set aside. Mix one egg and the half cup of milk in a bowl and put the panko crumbs in another with a little pepper and salt. Put your bacon grease pan over medium heat. Take your grits from the freezer and slice into 6 equal cakes. Now take your container and flip it over on a cutting board, it should only take 1 good hit and the cakes should come loose onto the board. When the grease is hot take the cakes and dredge them in the wet mixture first and then fully coat in the panko crumbs. Handle the grit cakes gently while in the grease. For some reason if the grits hit the grease with out the breading they act like little rocket propelled grenades of molten lava. No joke if they start popping, get them out immediately, I know this from experience. If you are gentle this should not happen. When the cakes have browned on both sides remove to drain. 4.Soft Poached Eggs: Click Here for a video on Soft Poaching. I think this is such a wonderful method to cook an egg. It provides a perfect texture and a beautifully runny center that will provide the perfect sauce for the dish. 5.Presentation: Spreads a small spoon full of the cheese sauce on the center of the plate as a base for your grit cakes. Place the first cake flat and lean the second against it. Next place one poached egg on each cake, add a little fresh ground pepper to the eggs. Next ladle some more of the cheese sauce over the egg and let run off the side. Finally take some of the crisp bacon and sprinkle it over the entire dish. Serve immediately, and enjoy!!! This entry was posted on Saturday, March 5th, 2011 at 3:15 pm	and tagged with Articles, Birmingham, Breakfast, Brunch, eggs, Grits, Meat, Pork, Recipes and posted in Uncategorized. You can follow any responses to this entry through the RSS 2.0 feed. I love grits, something my wife turned me onto long before we moved south. This sounds great. Thanks so much! I checked out your site, looks great!